Your piece. On a wall. In another city. On another continent. As you draw. GRL members in Berlin, Vancouver and Seoul are preparing for PWN THE WALL, an interactive digital graffiti event, connecting Berlin with Vancouver and Seoul. We will open our 25 hour installation friday night at Platoon Kunsthalle, Schönhauser Allee 9. Read all about the event here. A lot of preparation will be done before that to make it (at least for us) the event of the year. Feel free to visit us at Platoon the whole week before the event. We could always use a helping hand. To make the place as cosy as possible and inviting to lounge around during the event we are looking for furniture. If you’ve got a spare couch in your cellar or a floor lamp that you always wanted to get rid off or at least rent out for a weekend, contact us. We can organise the transport. Note: We are not in the Platoon Kunsthalle itself but in a building behind the Kunsthalle. This entry was posted in Berlin Cell, bombIR, PWN the wall. Bookmark the permalink. 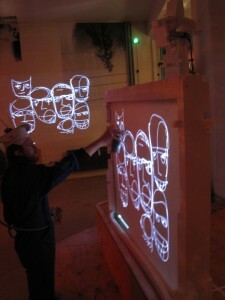 PWN THE WALL: Artists confirmed!